“David Jacobson and his band the Space Wizards are based out of Brooklyn, New York. They’ve played at Palisades, Sidewalk, Pete’s Candy Store, Pianos, Bowery Electric, and other venues around town. Their music is highly influenced by 60s and 70s psychedelia/rock and roll”. Check them out tonight (September 30th) at Rockwood Music Hall Stage 1 at 5pm. Listen to their latest single HERE. I’m not sure how to answer this one. My dad played electric guitar and my mom played piano and was always making up silly songs about our dogs or my siblings. We grew up listening to the Beatles, and Janis Joplin and the Grateful Dead. I remember getting really into Jimi Hendrix when I was 11 years old. That’s when I asked my parents for an electric guitar. I thought it would make me cool (it didn’t), and I dreamed of being the greatest guitarist in the world (still working on that one… seems to be more subjective than I thought). I started with classical piano lessons from age 4 until 16 or so. I took jazz guitar lessons off and on in highschool and college. I recently took some jazz lessons from a local jazz guitarist. I’ve taken some gypsy jazz lessons. I mostly learned guitar from watching youtube vidoes and lessons. I got a strong foundation from my teacher Aryan in high school. He taught me the basics, major scales, modes, how to transcribe solos etc. I learned a lot from the musicians I’ve played with. Everyone influenced me in their own way. A good friend from Gainesville, Dante, convinced me to focus more on my songwriting. How did the band come together? Tell us about each member. Jesse Lapin (bass) is my best friend’s little brother’s best friend’s girlfriend’s little brother. He is a guitarist by trade. The Space Wizards has been a rotating cast of different players, and I was reforming the band with one of the drummers that had been part of the group, and we needed a new bass player. I asked Jesse to switch to bass, and he was happy to oblige. Jesse is a film guy, he does archival footage. He’s super smart, easy going, and takes direction really well. He’s really talented, and has grown immensely in the year that he’s been in the band. He’s now writing songs, and learning to sing. He’s a real asset. Also, he’s the only member that brings people out to shows! So Jesse is pretty much the band’s MVP. Garrett Troy is our current drummer. We had lost our umpteenth drummer before Garrett, so I sent out some feelers on Craigslist and Facebook. We found one guy who really didn’t know how to play drums, so we decided to try someone else out. Garrett came in and was the most normal, easy going, talented, down to earth guy who had been to all 13 bakers dozen phish shows I had ever met. It turns out we had both been to some of those phish shows, so we hit it off from the beginning. Garrett has a real funky drumming style. He’s passionate, hard working, and reliable. He’s been a real asset to the band, because he shows up, cares about the music, and is always preaching the space wizard gospel to those he meets. He’s got a reggae style to his drumming which is really unique and interesting. He’s been in the band for about a year as well, and I’ve really enjoyed getting to know him. Carla Miranda: She’s my fiance and she’s been putting some background vocals on the tracks. What can I say? I love her so much, I asked her to marry me. Overall, the three of us have developed a really positive environment that’s conducive to exploration, and expression. We are all really supportive of each other’s creative goals, and it’s a really positive environment to work in. We practice weekly on Thursdays and we’ve got a lot of great new material coming in. The group has a lot of improvisational elements so that keeps things fresh and moving forward. Our next show is September 30th at Rockwood Music Hall Stage 1 at 5pm, don’t be late! 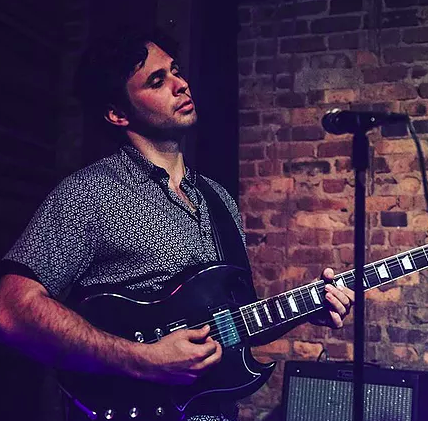 We’ve got a classic, psych rock vibe that has improvisational elements similar to Neil Young and Crazy Horse, the Grateful Dead, the Band, and Phish. We also draw on some more modern guys like Kurt Vile, William Tyler, and Heavy Blanket. Our favorite tune to play in the repertoire is always different. I guess right now it’s ‘pony boy’. Its very circular and rocking, and when we jam it’s easy to really dig in and wail. Although, audiences really love ‘dance blues’. It’s one people seem to be inclined to sing along to. Lots of guitar shredding, dynamics, intimacy, and a loose fun band.